A small perennial evergreen subshrub, with woody stems, colorful leaves, and blue to purplish flowers. It is a member of the mint family, Lamiaceae. It is native to the Mediterranean region and commonly grown as a kitchen and medicinal herb or as an ornamental garden plant. Dense, uniform, ornamental plants. Uses: Fresh, dried or cooked to flavor or garnish. As an herb, sage has a slight peppery flavor. In Western cooking, it is used for flavoring fatty meats (especially as a marinade), cheeses (Sage Derby), and some drinks. In the United States, Britain and Flanders, sage is used with onion for poultry or pork stuffing and also in sauces. In French cuisine, sage is used for cooking white meat and in vegetable soups. Germans often use it in sausage dishes, and sage forms the dominant flavoring in the English Lincolnshire sausage. Sage is also common in Italian cooking. Sage is sautéed in olive oil and butter until crisp, then plain or stuffed pasta is added (burro e salvia). In the Balkans and the Middle East, it is used when roasting mutton. 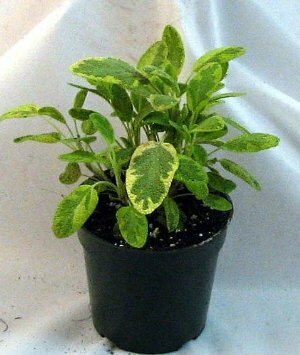 Indoors or out, Sage prefers full sun and keep evenly moist,not wet or dry. Trim the leaves as needed. Ships in a 3 inch pot.